Webflow Dropdown widgets by default only opens/closes when you click on the element. We are going to make all dropdowns open on hover only. We are going to be using CSS to override hover state. Go to the site dashboard Custom Code section. 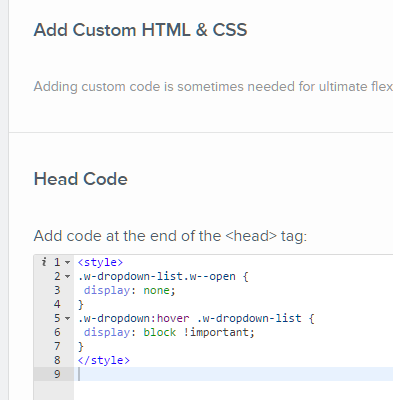 In the field "Add code at the end of the <head> tag", paste this CSS code. Publish your site to view it using the sub-domain. This does not work in the editor's Toggle Preview. Discuss or ask any questions on the forum at http://forum.webflow.com/t/23796.